Tonight we rejoined Our Heroes in the ice caves on a far off world. +Tim Shorts couldn’t make it, so we quickly recruited +Jake Bernstein, who joined +Peter V. Dell’Orto, +Christopher R. Rice , and +Nathan Joy in the quest to kill the aliens and take their stuff. No play-by-play transcript as I usually do when I’m playing, because my mind is on the game and keeping it moving. Or trying to. The basic play of the night was one long gun battle. We went into XCOM Time, and I thought as a GM that it worked really well. It gave each side time to do what they needed to do, and allowed us to cover a lot of in-game time in five-second chunks, which worked. We did go back to one-second turns as soon as anyone’s Wait was triggered, so no real loss in fidelity there. Just a decent way of keeping the sides close. They set up a brutal ambush against an enemy that is coming at them in waves. The NPC Christine Brinkman had been left as a rear guard, and manged to make an awesome Per roll, spotting the SM -4 bad guy drone a long way away. Aim, Brace, Reflex sight, and a very good Aim roll put her on target, and she totally drilled the drone. That left quite a bit of time for the team to get set, and they set up a brutal, and effective, ambush when the remaining drones came around the corner. The first two, I think, bit it hard, and the third was appropriately riddled with holes, but after putting a blaster bolt through Dragonskin armor on Jake’s character’s torso, which is 3d (5) against 10d armor (1d injury per hit). He also got nailed once on each leg, though, and that was more serious. We resolved the crippling injuries (in reality, Jake worked out the details of his own injuries while I continued play) and he’ll be off his game for 3 months! Ianali was able to sprint over, and accept a -10 to his First Aid roll (plus some rerolls) to get him back up to 1 HP, which kept him out of the “rolling for KO each second” bad place. After the first wave it, they set up and waited for the next wave. It came cautiously, and the drones staged their own ambush, using some Sectoids as bait. Christopher’s character Ianali tried to take one alive, carefully blowing off one leg (yowch), but then the guy with the grenade launcher opened up on the wall, pulping that guy and rendering the second, hidden next to a wall, unconscious. Three 40mm HE grenades will do a number on a small, unarmored alien worker. 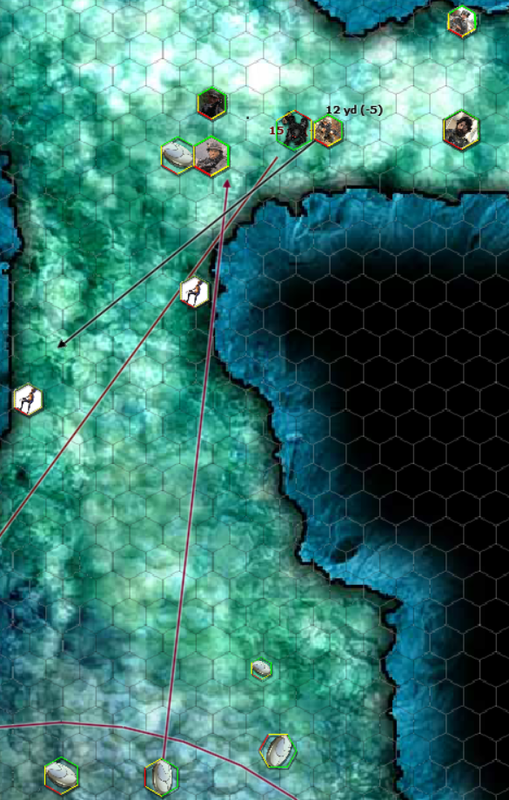 As the good guys came around the corner, though, one of the floaters tagged our grenadier on the torso and arm, which burned through his armor and did some real damage. Three grenades later and two of three floaters (these were much smaller and unarmored than the disc they met coming in to the caves) were damaged but still functional, the third untouched. The new rules we’re using for aiming are working really well. Fantasy Grounds lets you put down and leave range estimating lines on the map, and these are great for “cross this and my Wait triggers!” notations for laying ambushes and whatnot are great. We’re half-using +Mark Langsdorf‘s rules on rapid fire, though I think maybe we weren’t using them as correctly as I’d like. I think that, in retrospect, the RoF bonuses using the Size and Speed/Range Table might stack up too quickly. What I wanted was something where 3-4 shots (the usual number in “burst fire” got you your first bonus, but like Mark, I think that the SSR table is core to GURPS and should be used where possible. However, this means that with a gun with RoF 12, you are (with the RoF bonus) +4 to hit, which is just as good as Aiming using RAW with a carbine wit Acc 4. Unsighted firing at RoF 12 is simply NOT as good as aimed fire with the same rifle. So that bears more consideration. Maybe halve the values, rounding up. It will be self-limiting, as most normal rifles will be able to do this for 2 seconds and then a mag change. Peter’s character, with his 100-round drums, is better off. I used the “always add 10 to Per rolls, but full size and range penalties apply” rule often today, and it works great. It’s how Christine was able to nail the first floater drone, and how one of those drones missed seeing a PC at a critical moment, in a believable way. My map is too big, and I probably have too many enemies for the style of play I want to have for this campaign. This mission was designed to be one session long (notionally), two at the most, and we’ll finish in three. That means we can spend 6-8 weeks of real-world time (allowing for cancelled sessions) on what might be considered one to three firefights. Some of the teething issues with the interface have gotten better with use. It still does suffer from some issues, though, that make for some frustrations. The absence of Fog of War and sight lines really is an issue to the type of game we’re playing. HT needs to be on the combat tracker (if it’s there I didn’t see it) since you often have to roll that in combat. Same with Per, actually. The vision lanes that I have in MapTool (blocked out behind) with terrain features that can’t be seen through are awesome and really allow the GM to just play his side without worrying about who’s visible but unseen. I think today went pretty well, and the rules being used are working for the benefit of the game, not a distraction. Smaller maps, perhaps fewer but more capable foes (though what’s going on now isn’t bad), and a slightly different capabilty set for my bad guys will help out. It should be fun to finish up this mission. Of the six troopers that went in, two have been badly wounded by blaster fire, and there are still several drones active. The cave has barely been explored (and I say this because of an accidental full-frontal map reveal in a previous game; they know how big the place is). I will give serious though to how I can guarantee we finish up next time. Indiana Jones style cave collapse should end things quickly enough! I think RoF on the SSR, halved and rounded up, is probably about where you want to be. It's still fast to look up, gives reasonable bonuses for semi-automatics and SMGs, and makes birdshot useful against small, fast moving birds. There still needs to be a better way to handle Rcl. As it is, high Rcl guns are generally worthless for automatic fire, and they shouldn't be that bad. It should be difficult but possible to get use a .44M revolver to rapid fire 3 shots at a man-sized target at short range and have all of them hit.